Kerem Campers Have Arrived at Yavneh! Anyone here seen Harry Potter? To be honest I kinda fell off with them after they started to get gritty and edgy and PG-13. I was Harry Potter’s age when the first movies were coming out so that was cool but I was past young adulthood while Harry was all angsty. Simultaneously, my mom did read me most of the books to go to sleep at night so I’m not one of those bandwagon fans. The relationship is complicated. The relation between Harry Potter and Kerem (our aydah [age group] and CITs at Yavneh) is a bit less complicated however… is it because both are examples of creating magical times? Is it because like in the third book with the Time Turner subplot, the protagonists wish that they could relive every second for deeper meaning? Is it because I really like the Sorting Hat and the chanichim (campers) would look stylish with a sort of talking hat? As most of you may be aware, choose-your-own adventure blog posts are my favorite so I will allow you to decide. As for the chanichim, their fate is sealed and I can’t wait to tell you in what manner it was sealed! The story begins this past Sunday. After dropping off your kiddos, we played some quick charade-style games to break the ice before heading into aruchat erev (dinner). This writer has a serious affinity for food and is happy to report that the meals this summer have been FIRE, which for parents who haven’t heard this slang before, is a good thing. We had a BBQ and it was amazing. We ended the night with a peulah (activity) where the chanichim were given a chance to reflect on their goals for the summer on the agam (lake), hear from other chanichim about their nervous and excited points for the kayitz (summer), and receive their Kerem sweatshirts, a longstanding Yavneh tradition. The kiddos went to sleep excited for what was in store and ready to accept the coming challenges. let me tell you: it is when you have the Yavneh ruach in your heart and the future of the Jewish people on your shoulders. We then went to Hannaford’s to stock up on food for the summer. This is a privilege afforded only to the oldest of chanichim. That is Kerem in this case. We are the only ones who get food. Nobody else. Nope, not even another person who isn’t us. Deal with it. After aruchat tzohorayim (lunch) we had some rest time and meetings to prepare for the chanichim‘s arrival. Skipping to aruchat erev we had BBQ pulled brisket (NEXT. LEVEL.)!!! We spent the night playing Newlyweds, a game where chanichim were matched up and had to get to know each other in a 10 minute period to answer a series of follow up questions about each other’s personalities. Bonded and enlightened, the chanichim went to bed. What would the next boker (morning) bring? Well, like the skies early Tuesday morning, it was unsure. Sorry, unclear. We went to the Browne Center, a ropes course leadership training thing from 830-330! 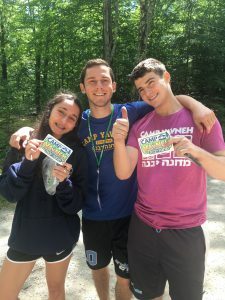 They pushed their limits, got even closer, and began to think critically about what they wanted to give to the chanichim this coming kayitz. With final meetings out of the way, Kerem had a viewing of mock Zimriyah (a singing competition that Yavneh has every year) (only since it was mock Zim they were fake songs) (ok, I’m gonna stop with the parentheses now because they’re probably getting a bit annoying) (one more) (gotcha!) (okay really done now) put on by the madrichim (counselor). It was fun and ended with aydat Kerem excited to start camp. Now I know I’m kinda the class clown when it comes to blogging (remember to put a clown emoji here), but I’m gonna break character for a second and be serious with you. 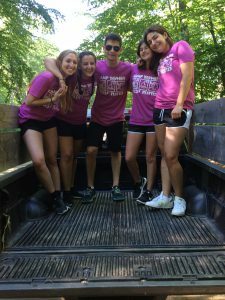 This writer has worked with these kids for the past 6 years–spending nearly every waking moment with them the whole summer. I honestly have never seen the chanichim act as positive, responsible, enthusiastic, kind, selfless and invested as I saw today. They did jobs that have always been reserved for madrichim with ease, they raised hundreds of dollars for inclusivity, they literally led over 300 chanichim into an all out 30 minute dance party (which hasn’t happened before ever), and so so much more. 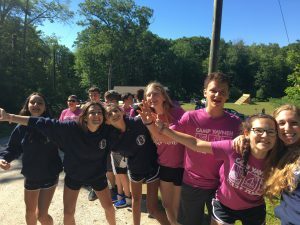 Today they blossomed into real leaders at camp and perhaps in life, and this writer’s pride and Yavneh’s is unbounded for them. You all can feel truly proud of what your children accomplished today. We ended the night around a campfire. The tzevet (staff) took a step back and, unprompted, the kids burst into Hebrew and English song and storytelling. They ended the night with their arms around each other, feeling closer and more unified than ever. We truly cannot wait for what this summer holds.